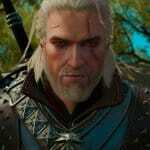 On this page you can find information about the skill system of Witcher 3: Wild Hunt. The full information has not been released yet, but we do have a pretty good idea of how the skills will function. For starters, there are a total of 4 skill categories: Combat skills / Magic (Signs) Skills / Alchemy Skills / Utility Skills. You can see the detailed skill trees in the screenshot below. The first 3 skill categories have 20 possible skills to unlock, and utility skills have another 10. 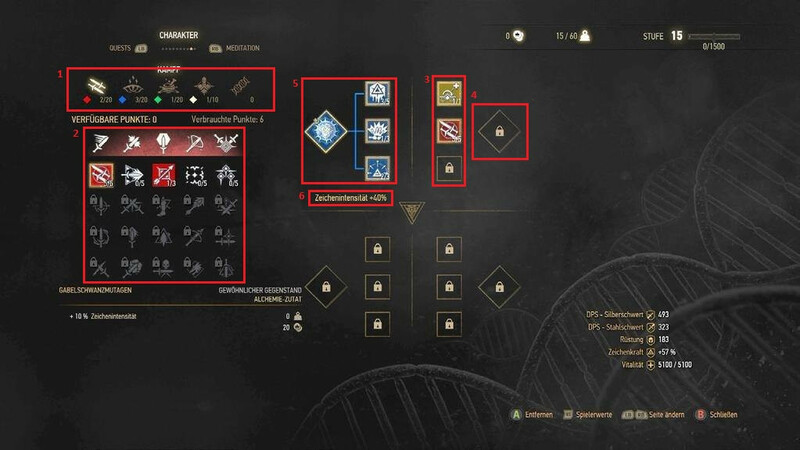 The fifth group in the list is Mutagens (looks like a DNA double helix in above screenshot), which will function differently by enhancing other skills. The skills are further divided into different groups (see below screenshot). For Combat skills, these 5 skill groups are: Fast Attack, Strong Attack, Defense, Crossbow, and Battle Focus. For Magic, skills are broken down into the 5 Witcher Signs: Aard / Igni / Yrden / Quen / Axii. The Alchemy skill groups are: Potions / Oils / Bombs / Mutation / Trial of Grass. The 4 skill trees of Witcher 3: Wild Hunt – Weapon Tree (red), Magic tree (blue), Alchemy tree (green) and Utility skills tree (white). Skills are unlocked by spending skill points; you can get points by leveling up (maximum of 60 levels), using shrines, and also from some quests. The first tier of skills is available from level 1, while the 2nd tier will require 8 points spent in the tree, 20 points for tier 3, and 30 for tier 4. When you learn a skill, you can put it on your skills bar (area # 3 in first screenshot); this bar starts out at only 3 skills but expands to include up to 12 skills as you level up. This in particular is a very cool mechanic, because most games give you all the skill slots right away, which is too much early on, and not enough in the late game (like Dragon Age: Inquisition with its 8 maximum skill slots). This also means that with a total of 70 skills, you have lots of freedom on how to build your character. Furthermore, you will be able to reset your skill build by purchasing an elixir. The second and most unique component of the Witcher 3 skill system are Mutagens. Mutagens can be equipped in the #4 area slots (first screenshot), and act as a booster to your currently-equipped skills. In the screenshot, you can see the blue Mutagen equipped in #5, boosting 3 of Geralt’s skills. Unlike normal skills, Mutagens are unlocked by killing specific powerful monsters, and cannot be changed once you equip them. Similar to other skills, Mutagens can have different colors (Red/Blue/Green/White). If you pair up Mutagen color with skill color, the bonus you get from that Mutagen will be multiplied, proportionate to how many skills of the right color you have equipped. Finally, here’s a quick useful video to sum up the Witcher 3 skill system. P.S: Thanks to reddit user miltek for the skill information.